MOOC mania is toast. Massive Open Online Courses (MOOCs) were expected to fundamentally change higher education. Clarissa Shen, Vice President of MOOC giant Udacity, recently conceded that MOOCs “are dead.” In their salad days, MOOCs would deliver the lectures of the “best faculty” to campuses around the US and the world. University administrators salivated at the idea of educating more students with fewer faculty. They could pay for one lecture and simply replay it repeatedly. In the minds of content developers and administrators alike college teaching is simply a matter of professors yammering away at an auditorium full of bored students. By capturing a set of lectures and rebroadcasting them—quality education would be within reach for everyone. Many of us knew that MOOCs would fail. MOOCs were a function of Web 1.0. In its first incarnation, the Internet was about content delivery. It was like cable TV with a lot more channels. Information was passed from the creator to the consumer. Almost every new communication technology to come along in the last century—phonograph records, radio, cassette tapes, television—was prophesied to displace traditional classroom education. They all failed. And for the same reasons that MOOCs bit the dust. MOOCs failed because of the limitations of Web 1.0 and a fundamental misunderstanding of the art and science of teaching. Yes, we do lecture. Despite derisive comments about the value of lecturing—and chants to kill “the sage on the stage”—they will continue as a staple of college teaching, and for good reasons. However, college teaching is about more than lecturing at students. Lecturing is the beginning. Discovery is the end. Bloom’s taxonomy of learning is a staple among educators. It stipulates that there are levels of learning (e.g., remembering, understanding) arranged from lower level thinking skills to higher level thinking skills. Each level of thinking skills is associated with activities that promote learning at that level. MOOCs and Web 1.0 cater to lower order thinking skills like remembering and understanding. MOOCs transformed the “sage on the stage” into the “sage on the screen.” That is not an improvement. In fact, it degrades the craft of teaching by assuming that the lecturing professor is nothing more than a communication device, a robot. A skilled lecturer constantly scans the room, reading faces, calculating which students are bored, distracted, or failing to comprehend. They adapt and adjust on the fly, throwing in a joke to shake up the room, adding in a detail from yesterday’s news to illustrate a point, or exploring an alternative means to explain so that students better understand the material. They are answering questions. A recorded lecture cannot do any of that. MOOCs and Web 1.0 technology operates on the assumption that all students learn the same way and at the same rate, and that is not true. Because MOOCs were a passive and non-adaptive technology, users failed to complete these courses at alarming rates. Surprised? I know that I have several audio tape collections and computer programs around my house that are a monument to my failure to master a foreign language. Maybe you do too. Why did I fail? Because I do not have the self-discipline necessary to benefit from passive learning resources. I am not an autodidact. Most of us are not autodidacts. Those who succeed in MOOCs come from wealthier families and are already high-achieving academically. Failure to succeed in an online setting is highly likely when students have not developed strong study and learning habits. Technology has an important role in educating students. The Internet was not ready, and MOOCs were not the right tool. Students need to develop digital literacy because it is part of their future work. Faculty must engage technology, to one degree or another—I am not suggesting that all faculty teach the same way (I have railed against that)—to help students develop higher order thinking skills. MOOCs did not fail as a result of faculty resistance. MOOCs failed because they could not and did not maintain or improve student learning. Faculty resisted MOOCs because faculty are committed to student learning. Throw out the bath water. Keep the baby. Web 2.0 is interactive. It allows students to engage in content creation—application, analysis, evaluation, and creation. Web 2.0 is better suited to help students develop digital literacy and higher order thinking skills. However, if we use Web 2.0 technology with a Web 1.0 mindset, it will fail miserably. Future learning needs to focus on engaging students in content creation. Students can use technology to immerse themselves in the process of discovery and achieve the digital skills that will make them lifelong learners able to adapt to a range of careers and job demands. Most assume that students born in the digital age are naturally technologically gifted. Digital nativity does not convey technological literacy. Raamish Saeed, a senior at St. Louis University, made this point at the New Media Consortium’s Summer Conference: “We are not very tech savvy coming into college. Other than playing games and basic Microsoft office, there are many things we don’t know.” Huge inequalities in access to technology related to race and class, documented in a 2015 Pew Study, exacerbate the issue of students’ readiness to achieve technological literacy. This finding is indicative of the challenges that campuses with lower income and minority student populations, like California State University Channel Islands, a majority-minority campus with a majority first-generation college population. Because campuses differ, Web 2.0 promises the potential to adapt digital tools to the unique challenges and potentials of different student populations. Technologies aimed at the “average student” will miss on either side of the mean most of the time—that is just simple math. Focus on substantive assignments that are explicitly related to course content. Students should be convinced that an assignment is directly related to course objectives and not a “make work” assignment or afterthought. Assignments should allow students to become content creators. Somehow the students’ work should become accessible on the Internet. It might be deposited in a library’s institutional repository, hosted on a website, or become part of a virtual exhibit. This can convince students that their work has a purpose that goes beyond an essay that only their professor will read. This also raises the stakes for their assignment—anyone in the world can access their product, it will forever be associated with them. In the case of outstanding assignments, students can add their work to their professional website or LinkedIn profile to demonstrate their abilities to potential employers or graduate schools. Web 2.0 tools allow faculty to adapt digital tools to the purpose of the course and the needs of the learner rather than expecting the learner to adapt to the tool. This approach to technology puts faculty in charge of their content and their teaching. It gives them access to digital tools that can improve student learning for their campus population. Faculty can adopt tools that enhance their course learning objectives, resulting in meaningful learning experiences. Technology is a lever, not a crutch. Incorporate technology with intention. Know when to, and when not to, use technology. Use technology when it has the promise to improve student learning. That may seem obvious, but it was not so obvious to the brain trust behind the development of MOOCs. Digital content, like tutorials, needs to be consistent with the objectives of your course. Using cookie-cutter tutorials to teach students digital skills is Web 1.0 strategy. Students need to know how the tool is part of their learning—why they are using the tool and how it will enhance their learning. They need to know that you understand the mechanics and you have used the tool to create a substantive product. In short, be a model. Digital tools vary in their complexity. With our student population at CSU Channel Islands, I have achieved the best outcomes by “scaffolding” within tools and then across similar tools. Students are required to complete projects with a limited scope and lower stakes before moving on to more complex tasks with higher stakes. Scaffolding is a good strategy for moving students toward more complex tools. I like to introduce students to a simpler version of a tool before transitioning them to the more complex digital tool. For instance, one tool I use with students is TimelineJS, an open-source, multimedia tool developed by Knight Lab at Northwestern University. Once students have relative mastery of timelines, they can move to a tool like Neatline Timeline, which is more flexible but also a little more technical. Students who learn using these digital tools are developing transferable skills—hard skills and soft skills. TimelineJS relies on a Google Sheets as the foundation of the finished timeline. Google Sheets is similar to Excel, a program that is widely used by employers. That is a hard skill. Creating a timeline involves students “curating” a story, picking an choosing events, describing how events are related, problem-solving, and finding associated media to “tell a story.” Those are soft skills that translate well to any workplace. Most importantly, when a student is done with an assignment, they have a deeper understanding of the subject and have created unique content. Using digital tools can make education more meaningful for students. Web 2.0 is not going to make education cheaper or easier. It is impossible to adhere to these principles at a MOOC-like scale or to run these courses on auto-pilot. Sorry administrators, you need to find your “efficiencies” elsewhere. Creating courses that encourage digital literacy and promote curiosity, inquiry, creativity, and discovery requires more than choosing a few tutorials and leaving students to “figure it out.” It requires that faculty take an active role in curating, even creating, appropriate tutorials and following up with classroom discussion and troubleshooting. “Canned” tutorials are more appropriate for learning a simple skill like inserting headers and footers in a Word document than teaching a more complex set of skills in context. Finally, it is worth repeating that I believe that there is plenty of room in the curriculum for tried and true pedagogies including lecturing, case studies, simulations, and others. Students need to be exposed to multiple pedagogies to become full-functioning lifelong learners. 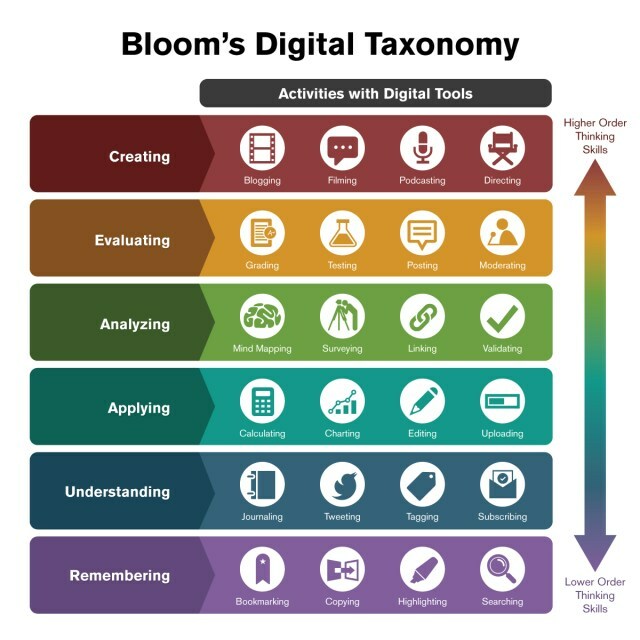 Incorporating digital technologies needs to be a tool in a teaching toolbox full of useful tools, not the notorious hammer that turns every teaching challenge into a nail. That is a recipe for failure. Just take a look at MOOCs.